BOISE - A long-awaited coffee shop is on deck for Boise's Barber Valley - near the corner of Warm Springs Ave. and Eckert Rd. 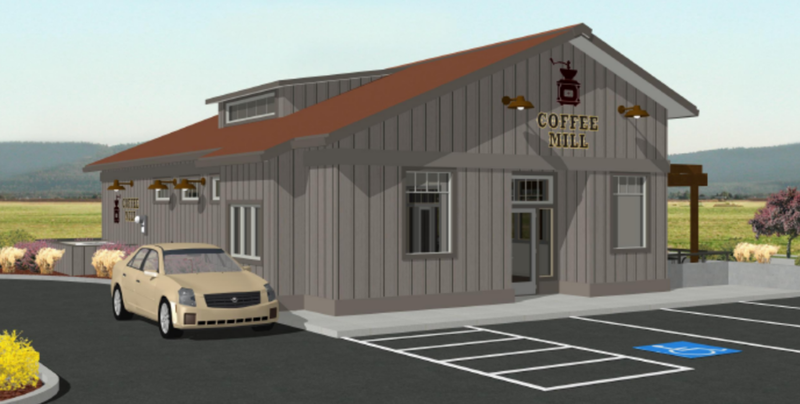 Coffee Mill has submitted plans with the City of Boise for an 1,875 square foot coffee shop with a drive-through lane, indoor seating and a patio. The Barber Valley area is one of Boise's fastest-growing, but has been generally underserved with commercial businesses outside of Lucky 13 pizza, Ranch Market convenience store and the soon-to-close Ben's Crow Inn. The new project would sit immediately to the west of Ranch Market and feature a similar exterior look and feel. Indoor seating for 36 will be supplemented with an outdoor patio with seating for another 28 when weather permits. A small kitchen area is also part of the plan. The Coffee Mill project is owned by Steve Tracy according to filings, who is also listed as the owner of the market next door. The building design and plan must be approved through Boise's design review process before a building permit can be issued and construction can begin.